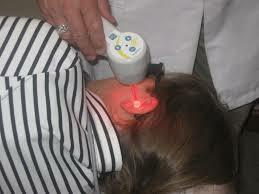 Laser therapy is the use of monochromatic light emission from a low intensity laser diode (250 milliwatts or less) or an array of high intensity super luminous diodes (providing total optical power up to the 2000 milliwatt range).Conditions treated include musculoskeletal problems, the arthritides, sports injuries and dermatological conditions. The light source is placed in contact with the skin allowing the photon energy to penetrate tissue, where it interacts with various intracellular biomolecules resulting in the normalization of cellular components. This also enhances the body’s natural healing processes. Short Term Effects Production and release of beta-endorphins (these are morphine like substances produced by various cells in the body that inhibit the sensation of pain) Cortisol production is increased (cortisol is the precursor of cortisone). This enables the body to combat the stress associated with trauma or the disease process The short-term effect is significant in 5-10% of cases during or after the conclusion of the initial treatment, but is not as important as the long term or cumulative effect Long Term Or Cumulative Effect ATP (adenosine triphosphate) production is increased resulting in improved cellular metabolism DNA (deoxyribonucleicacid) production; the protein building block of tissue is substantially increased Neurotransmission is facilitated due to elevated levels of serotonin and aceytylcholine Mitochondrial activity is stimulated resulting in cell replication etc. (i.e. replacement, regeneration and repair of abnormal cells) Modulation of macrophages, fibroblasts and other cells Angiogenesis (formation of new blood vessels) Regulates cell membrane potential, essential in Na, Cl and K ion transfer (electrolyte balance) Cytokines and other chemicals enhancing cellular communications are released Other Effects The immune response is stimulated Lymphatic drainage is improved The histamine response is positively altered Production of growth hormone is increased The body’s natural healing processes are enhanced The beneficial physiological changes noted above are the result of cellular stimulation and tissue regeneration. 1. There is more published clinical and physiological evidence supporting the use of laser and LED photobiomodulation for soft tissue injuries and joint conditions than any electrotherapy modality as traditionally used by physicians and physiotherapists. 2. It’s considered the safest “electrotherapy” available by research experts. 3. It’s quick and simple to apply. 4. It can be used immediately after injury, over pins, plates and bony prominence’s. 1) Not suitable for the following groups: cancer patient, pregnancy, patient with hemorrhagic diseases and peace maker. 2) The elder patients and sensitive patients must accept the low-power and short-time treatment at the beginning, the rate of work could be increased as the body adjusts.